Today starts a new challenge at Sasayaki Glitter Stamps! The them is PURPLE!! I created this very simple but adorable card using an elephant! I think its so much fun to color them in different colors other than their actual natural colors! Isn't he cute? Simple, right? 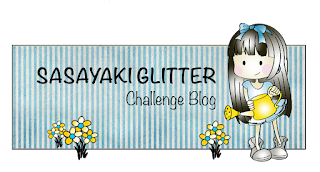 I hope that you visit Sasayaki Gliter Stamps challenge blog and join in the fun challenge!!!! Simon Says Stamps Challenge: Tag you are IT! Love your purple ellie, and I like the off-set ribbon holder! Thanks for sharing this with us at the Simon Says Stamp Wednesday challenge! Gorgeous.. I love purple elephants and your sentiment is super sweet. Thank-you for joining us at the Crafting with an Attitude Challenge 'Anything Goes' March 2017.